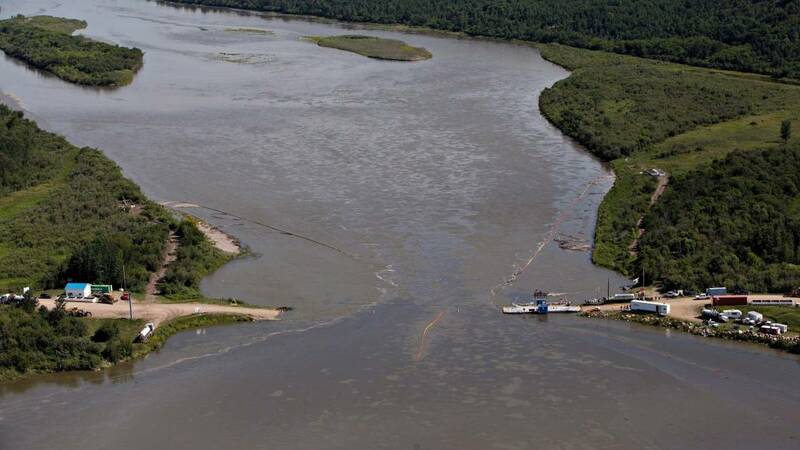 Environment Canada and Climate Change (ECCC) recently laid a number of charges against Husky Energy Inc. and Husky Oil Operations Limited relating to the blended heavy crude-oil spill, in July 2016, which impacted the North Saskatchewan River, near Maidstone, Saskatchewan. The Government of Saskatchewan also filed a charge under the Environmental Management and Protection Act, 2010. These charges result from a 19-month joint federal-provincial investigation. There are a total of ten charges which include one charge under subsection 36(3) of the federal Fisheries Act, one charge under subsection 38(5) of the federal Fisheries Act, six charges under subsection 38(6) of the federal Fisheries Act, one charge under the federal Migratory Birds Convention Act, 1994, and one charge under Saskatchewan’s Environmental Management and Protection Act, 2010. The first appearance was at the end of March at the Lloydminster Provincial Court office. According to the Premier of Saskatchewan’s office, the company faces a possible maximum $1 million fine. Saskatchewan Minister of Environment Dustin Duncan said the spill led to significant changes in the provincial Pipelines Act; changes that include greater regulation, auditing powers, penalty provisions and licensing flowlines. “We take this very seriously. There, to my knowledge, hasn’t been a charge with respect to the unintended release of oil from a pipeline in the province’s history,” he told reporters in late March. Duncan said the site cleanup was completed by the end of last year, but Husky will have to work with the province’s Water Security Agency and the Ministry of Environment to make sure nothing else is required. He said he expects full co-operation. “In the last year, despite a very unsettling situation, Husky was very responsive when it came to the cleanup but also responding to the concerns by First Nations, by communities along the river, as well as to the requests that were made by the government department,” Duncan said. All charges are currently before the Court, and they have not yet been proven. Under Canadian law, those charged are presumed innocent until proven guilty. Therefore, Environment and Climate Change Canada and Saskatchewan’s Water Security Agency, which has a responsibility for the specific charge under the provincial Environmental Management and Protection Act, 2010, will not be commenting further at this time. As reported by the CBC, New Brunswick Southern Railway has pleaded not guilty to 24 charges related to the transportation of oil. Defence lawyer Catherine Lahey entered the pleas on the Irving-owned company’s behalf during a brief appearance in Saint John provincial court on earlier this month. The charges against the railway, a subsidiary of J.D. Irving Ltd., stem from a Transport Canada investigation triggered by the 2013 derailment that killed 47 people in Lac-Mégantic, Que., prosecutors have said. Twelve of the charges under the Transportation of Dangerous Goods Act relate to failing to create proper shipping documents for the purpose of transporting petroleum crude oil. The other 12 charges relate to having unqualified personnel handling dangerous goods — crude oil. The offences are all alleged to have occurred between Nov. 3, 2012, and July 5, 2013, at or near Saint John. Irving Oil would have imported about 14,000 cars of crude for its Saint John refinery during that period. New Brunswick Southern Railway is part if NBM Railways, a subsidiary of J.D. Irving Ltd., which also includes Cavendish Farms, Kent Building Supplies and Irving Pulp & Paper. A trial date will be set on June 4. Judge David Walker said the Crown is expecting to take about three weeks to present its case. There is no word on how long the defence will take. Pleas were delayed last month because the defence was still in the process of receiving an estimated 9,000 disclosure documents from the Crown. In October 2017, Irving Oil was ordered to pay $4 million after pleading guilty to 34 charges under the same act. Those charges related to failing to properly classify the crude oil it transported by train and inadequately training its employees in the transportation of dangerous goods. 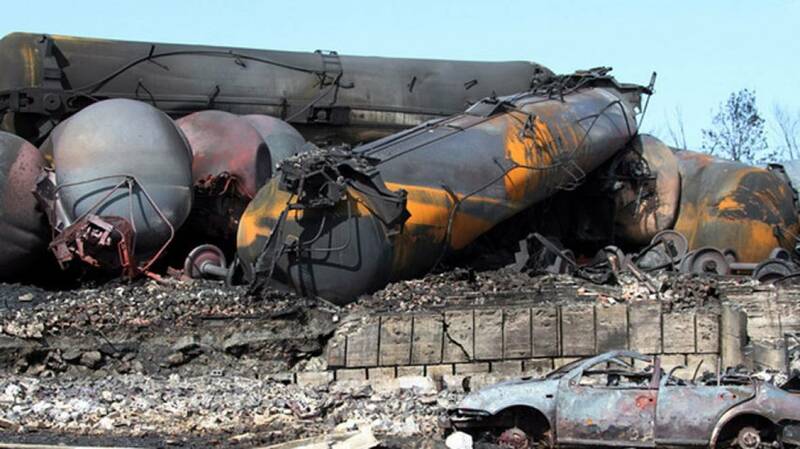 The crude oil in the derailed rail cars that exploded in Lac-Mégantic was destined for Irving’s refinery in Saint John. New Brunswick Southern Railway, along with its sister railways — Maine Northern Railway and Eastern Maine Railway — operates 883 kilometres of railway in New Brunswick and Maine. Recently, the Ontario Minister of Research, Innovation and Science, Reza Moridi, launched Ontario’s Cleantech Strategy (the “Cleantech Strategy“) which aims to catalyze the growth of Ontario’s clean technology sector to support sales into a global market which is expected to grow to $2.5 trillion by 2022. The Cleantech Strategy is aligned with Ontario’s five-year Climate Change Action Plan (CCAP) to fight climate change, reduce greenhouse gas (GHG) pollution, and drive the transition to a low-carbon economy. It is also aligned with Ontario’s Business Growth Initiative (BGI), which is, among other things, assisting innovative companies to scale up. By helping our cleantech companies get ready to scale – and helping them to connect to early customers here in Ontario – Ontario is supporting innovation and reducing emissions and environmental impact across industries. Over the longer term, we expect to see more scaled-up Ontario cleantech companies recognized as North American leaders. Ontario has the largest share of cleantech companies in Canada and the Cleantech Strategy further supports the province’s leadership in GHG pollution reduction through the development and scaling of cleantech solutions. Based on Ontario’s strengths in cleantech and global demand, the Cleantech Strategy prioritizes the following four cleantech sub-sectors: energy generation and storage, energy infrastructure, bio-products and bio-chemicals, and water and wastewater. Initiatives funded through Ontario’s carbon market as part of the Cleantech Strategy include the Global Market Acceleration Fund (GMAF) and the Green Focus on Innovation and Technology (GreenFIT). The GMAF will help companies lower the risk associated with expanding production of a proven clean technology. The fund will also assist companies with the cost of scaling up inventory, distribution and sales to domestic and global markets. The GMAF can provide between $2 million and$5 million of funding to Ontario-based companies with promising GHG reduction technologies and scale-up and export potential. To receive funding, these companies must be able to demonstrate funding commitments for at least 50% of the eligible project costs. A total of $27 million has been allotted to the GMAF. Through the GreenFIT program, Ontario will commit $10 million towards demonstration projects of new technologies and services. Early adoption of these new technologies and services will benefit both the adopting public sector institutions with support for their emissions reductions and participating companies with opportunities for validation and credibility for their products. Richard Corley is a partner at Goodmans LLP and leads the firm’s Cleantech Practice Group. Sophie Langlois is an associate at Goodmans LLP. She practices in the area of corporate and securities law and mergers and acquisitions. Catherine Lyons is a partner at Goodmans LLP. She dedicates her practice to representing both private and public sector clients at the intersection of municipal and environmental law. This article was first published on the Goodmans LLP website. The Supreme Court of Canada is hearing a controversial case this week concerning who is responsible for cleaning up toxic industrial sites when a company goes bankrupt. At stake is potentially billions of dollars in environmental clean-up costs. And entities ranging from governments to Canada’s big banks to oil and gas companies and farmers are all looking to ensure that they don’t end up on the hook for cleaning up toxic sites – many of them in remote rural and northern areas of the country. The case itself focuses on a small Alberta oil company, Redwater Energy, which entered creditor protection in 2015. Only a few of the company’s assets had value, so the bank wanted to sell those wells to recover some of its debt and abandon the rest of the oil and gas sites. The question became whether Redwater’s assets should help pay its debts or be used to pay for the cleanup cost of its worthless oil and gas wells? The case will address a fundamental public policy dilemma about what happens when a resource company bites the dust. For instance, every mine in the country has environmental regulations attached to its licence about reclaiming the site when the mine closes. But if the company goes belly up, does the bank take over those end-of-life responsibilities? If not, is the site abandoned or do taxpayers pick up the hefty tab? The question for the Government of Alberta and area farmers that had Redwater oil and gas wells on their land became whether Redwater’s assets should help pay its debts or be used to pay for the clean-up cost of its worthless and contaminated work sites? The Supreme Court case addresses a fundamental public policy dilemma about what happens when a resource company fails. Every mine operation in Canada has environmental regulations attached to its licence about reclaiming the site when the mine closes. But if the company goes belly up, does the bank take over those end-of-life responsibilities? If not, is the site abandoned or do taxpayers pick up the hefty tab when the provincial government pays to clean it up? And how much cost should farmers and other landowners bare for clean-up and reclamation costs? “We need to be able to ensure the people of Alberta, collectively, are protected,” Alberta Premier Rachel Notley told reporters earlier this week. The Alberta Energy Regulator (AER) says there are approximately 1,800 abandoned oil and gas sites in that province alone and pegs the cost to remediate them at $8.6 billion. If the Supreme Court sides with previous court rulings, the AER will likely respond by increasing the orphan levy imposed on well licensees. However, a portion of the expense will inevitably fall to the provincial government, and thus to taxpayers. But if the Supreme Court decides to reverse the decision, it will create hesitancy among lenders. Financial institutions will likely respond by tightening their purse strings as they begin pricing the risk into new loans made out to the industry. This case has consequences that reach far beyond one small energy company. The Redwater case could act as precedent in other provinces. If the previous rulings are upheld, it will send a clear signal to natural resource companies’ creditors that bankrolling fossil fuel infrastructure, mining projects, and pulp and paper mills without accounting for clean-up costs is not only acceptable, but encouraged in a legal climate where the public—not the polluter—pays. The provincial governments of Ontario, which currently has about 2,400 oil and natural gas producing wells, along with British Columbia and Saskatchewan have also joined the Supreme Court Case, which will be heard in Ottawa this week. The Canadian Association of Petroleum Producers is also an intervener in the legal case. As reported in the Vancouver Sun, researchers at Natural Resources Canada are discovering important characteristics of bitumen (the un-processed form of crude oil from the Alberta oil sands) and its interactions with the environment. Information from the research will be useful in the development of strategies and technologies to clean-up bitumen in the event that is leaks into the environment as a result of a pipeline leak or tanker spill. One important question with respect to bitumen is whether it sinks or floats when it hits the water. The short answer is it floats, most of the time, according to a growing body of research being compiled by Natural Resources Canada scientists. Researcher Heather Dettman, a senior scientist with Natural Resources Canada in Devon, Alta., is leading a team looking into some of those questions in research under the federal government’s world-class tanker safety program and ocean protection program. Postmedia caught up with her and a spokesman from Western Canada Marine Response Corp. to talk about answers. Q: What is diluted bitumen? A: Bitumen is the basic, tar-like petroleum product extracted from the Athabasca oilsands, which are oil deposits that were first formed deep underground, but were moved closer to the surface by geological movements of the earth. That allowed microbes to degrade the components that make up gasoline and diesel leaving only its asphalt components. Producers inject those lighter components back into bitumen to make it thin enough to flow through pipelines. Q: How would rough seas change the behaviour of diluted bitumen? A: “From a density perspective, it will be floating unless it’s really stormy, then it can go anywhere, the same as any other petroleum product,” Dettman said. 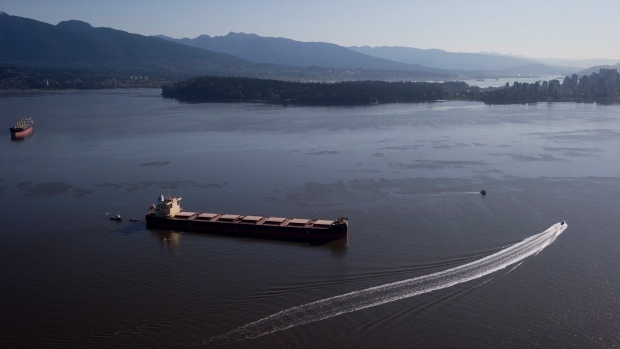 If a storm pushed bitumen ashore, it would pose the problem of having to clean it up on land. Q: Has there ever been a spill of diluted bitumen on the coast? 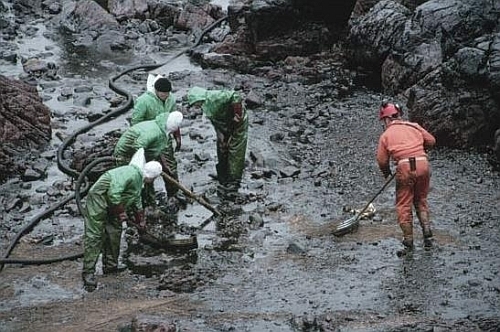 A: The biggest spill that the Western Canada Marine Response Corp. has dealt with involved a mix of bitumen and synthetic oil, said spokesman Michael Lowry. That was the 2007 puncture of Kinder Morgan’s Trans Mountain pipeline in Burnaby that led to about 100 tonnes of oil flowing down storm drains into Burrard Inlet. In nice weather and close to the industry-funded spill responders’ facilities, Lowry said they were able to recover 90 per cent of the oil. “Those are ideal conditions; I can’t extrapolate those to other spills for sure,” Lowry said. Q: How do you clean up a bitumen spill? A: Lowry said methods haven’t changed much over the years. Chemical dispersants, in situ burning and mechanical recovery are the techniques that responders use, but since the first two require government permission, the corporation focuses on mechanical recovery — booming and skimming. From its 2007 experience, Lowry said responders learned that its brush skimmers — conveyors that rotate heavy plastic brushes over the surface to collect oil — were particularly effective. Q: What research is being done to improve spill response? A: Lowry said new tools are being developed, such as advanced booming systems that perform better under tougher conditions, which the corporation deploys. In the meantime, Lowry said Environment Canada and Natural Resources Canada are putting resources into studying the topic. 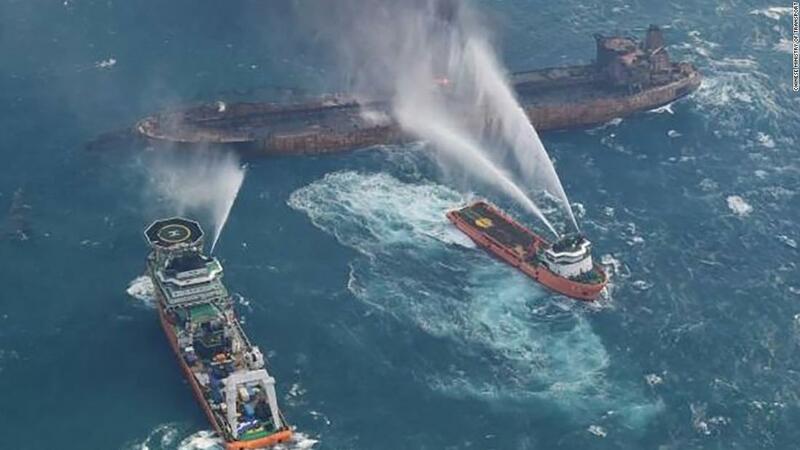 As reported by Cally Carswell in Nature, When the Iranian oil tanker Sanchi collided with a cargo ship, caught fire and sank in the East China Sea in mid-January, an entirely new kind of maritime disaster was born. Nearly two weeks later, basic questions remain unanswered about the size of the spill, its chemical makeup and where it could end up. Without that crucial information, researchers are struggling to predict the short- and long-term ecological consequences of the incident. The infamous spills of the past — such as the Deepwater Horizon disaster in the Gulf of Mexico in 2010, or the Exxon Valdez tanker rupture in Alaska’s Prince William Sound in 1989 — involved heavier crude oil. It can remain in the deep ocean for years and has chronic impacts on marine life. The Sanchi carried a little more than 111,300 metric tons of natural gas condensate, a lighter, more volatile petroleum product which doesn’t linger as long in the environment. Condensate has never before been unleashed into the sea in large quantities. Unlike heavy crude, condensate doesn’t accumulate in shimmering slicks on the water’s surface, which makes it difficult to monitor and contain. Neither does it sink to the ocean floor, as do some of the heavier constituents in crude over time. Rather, it burns off, evaporates or dissolves into the surface water, where some of its chemical components can linger for weeks or months. A significant, but unknown, portion of the Sanchi’s condensate probably fuelled the fires that followed the collision. In the waters immediately surrounding the tanker, Portier says, the conflagration and gaseous fumes would have killed off or injured phytoplankton, along with birds, marine mammals and fish that were caught in the vicinity when the tanker ignited. Moving beyond the fire, the impact of the accident becomes harder to discern. That’s because the exact chemical composition of the condensate has not yet been made public, Steiner says, and because no one knows how much of the condensate dissolved into the water. Because this type of spill is new, Portier says, researchers don’t yet understand the ultimate consequences of acute exposure to condensate in the sea, where it’s breaking down and dispersing. “That’s really where the science is missing,” he says. Researchers are also scrambling to assess where pollutants from the Sanchi could travel. Groups in both China and the United Kingdom have run ocean-circulation models to predict the oil’s journey, and the models agree that much of the pollution is likely to end up in a powerful current known as the Kuroshio, which flows past southeastern Japan and out to the North Pacific. The European models suggest that chemicals from the Sanchi could reach the coast of Japan within a month. But the Chinese models indicate that they are unlikely to intrude on Japanese shores at all. Katya Popova, a modeller with the National Oceanography Centre in Southampton, UK, isn’t sure why the models disagree. But she says that the discrepancy points to the importance of forging international collaborations to increase confidence in model projections during emergencies. “This is something that the oil industry should organize and fund to improve preparedness,” she says. Fangli Qiao with China’s State Oceanic Administration in Qingdao says his group’s models indicate that the pollution’s probable path overlaps with Japanese sardine and anchovy fisheries. But Popova cautions that the models are not necessarily good indicators of potential harm to fisheries or coastlines. In early December, a section of the Keystone Pipeline leaked 210,000 gallons of oil near the South Dakota City of Amherst. Representatives of Trans-Canada Pipeline, the owner of the pipeline, deemed the detection of the leak and prompt spill response as an example of its exemplary contingency measures that are in place to detect and respond to such incidents. 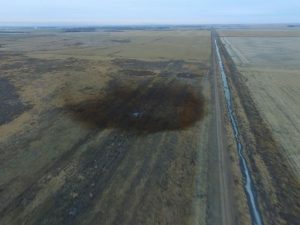 An aerial view shows the darkened ground of an oil spill which shut down the Keystone pipeline between Canada and the United States, located in an agricultural area near Amherst, South Dakota. When fully complete, the Keystone Pipeline will carry bitumen from the Alberta oil fields to refineries in Texas. 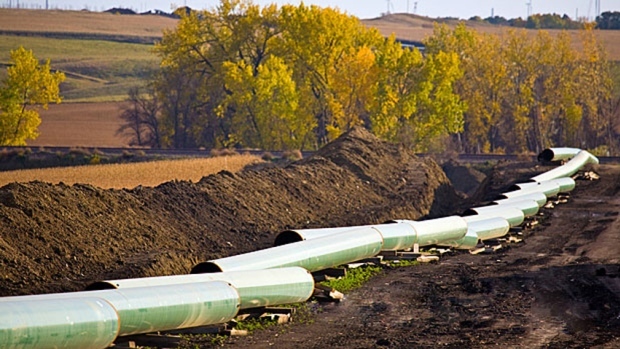 At present, the pipeline runs from Alberta, through North Dakota and South Dakota. As reported in the Prairie Public News, Julie Fedorchak of the North Dakota Public Service Commission (PSC) stated that the company’s quick response to the incident shows that its response plan worked perfectly. 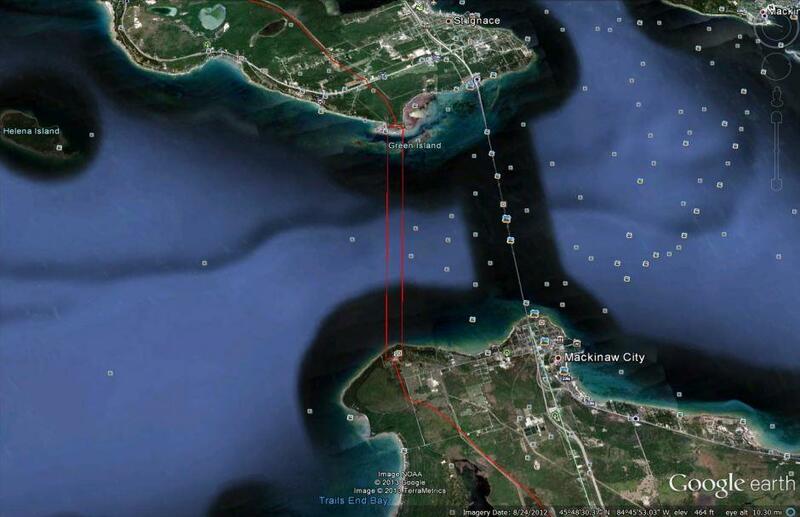 Fedorchak said the spill showed up on its detection equipment, and the people overseeing system noticed it, and. But Fedorchak said there are still questions about why the spill happened. Fedorchak said it’s important that the company and federal pipeline regulators do the tests needed on that pipeline, to try to figure out what caused it. “That’ll be a learning opportunity for the entire industry,” Fedorchak said. The company believes it may have been caused by an abrasion on the pipeline coating, that happened during construction. Clean-up work continues at the spill site.